You're much more likely to spot nits on your child's head than hatched bugs - because nits don't move! So, what do head lice nits look like? Read on for descriptions and photos of nits, plus detailed instructions on how to check your child's head thoroughly. A nit is a small hard case containing a louse egg. Small is the operative word. How tiny? Smaller than the flat metal head of a pin. About the size of the dot under the exclamation point at the end of this sentence! Nits are pale in color. Whitish, yellowish, light tan. Therefore, they may be a little easier to spot in dark hair. No matter what color the hair, a strong light is necessary - and a magnifying glass can be really helpful. Nits are glued onto the hair shaft using incredibly strong, hard nit glue that encircles the hair shaft. They're attached at an angle. 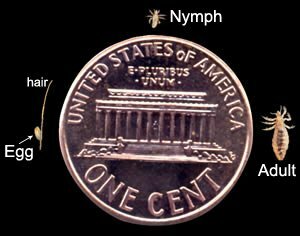 You won't be able to see the angle when you're looking at nits in your child's hair, but you can see it in the magnified photos below. Lice attach their nits very close to the scalp. The eggs need the warmth from a human head in order to stay viable. So concentrate your search on the hair no more than half an inch from the scalp. If you find nits on hair further away from the scalp, they are probably empty. (The eggs have already hatched). These may remain in the hair long after a lice infestation if not deliberately removed, but they pose no threat - and are so small they will usually go unnoticed. Lice have certain favorite places to hide their eggs - the most protected places like the nape of the neck and around the ears. I look in these areas first. However, nits can be anywhere on the head. A bright light is essential when doing a head check. Natural full-spectrum sunlight is best. If that's not possible, then use the brightest light you can find. It's even better if you can position the light to shine directly at the head where you are searching. If you're checking a girl with long hair, get some hair clips. Keep all the hair clipped up except the section you're looking through. Go through each section systematically so you know which sections you've checked, and which still need to be checked. You may come across all sorts of tiny, pale-colored debris in the hair. At first it may be hard to tell what you're looking at and whether it might be nits. Here's a tip: You can pick lint, dandruff, shampoo residue and such out of the hair pretty easily. This is NOT the case for nits, which are attached with strong nit glue. Because the nit glue encircles the hair, you generally can't remove the nit from the hair without pulling it all the way down the strand of hair and off the end. So if you find teeny pale objects that you can't get out without pulling them down to the ends of the hair … that's your confirmation that you've actually got lice. Okay, if you know you've got them … move on to how to remove nits. Return to What Do Lice Look Like?